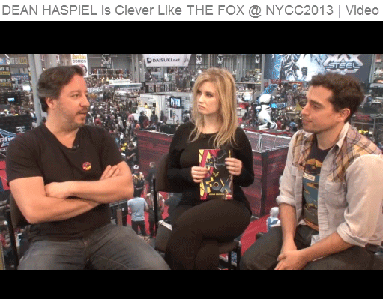 Newsarama interviewed Dean Haspiel on THE FOX in their skybox at New York Comic Con. In this video interview, Haspiel discusses the history of The Fox, how the character ties into the world of the New Crusaders (can you guess who he’s related to? ), how he and Mark Waid collaborate on the series, and some of the special “perks” of The Fox’s costume. PLUS: See if you can find Waldo! The Fox #1 is only a week away! Make sure you head to your local comic shop on Wednesday, October 30th to pick up the first thrilling issue of The Fox. And, if you’re in the NYC area the day of the first issue’s release, stop by JHU Comic Books at 32 East 32nd St., (between Madison & Park) at 6:00 to get your issue signed by Dean Haspiel himself!